He pastored rapidly growing Avenue Road Church in Toronto, which he had started with only his family and a few friends. He became vice-president of the newly formed Youth For Christ International organization in 1945. He then nominated his good friend, Billy Graham, to be field evangelist for the new ministry. 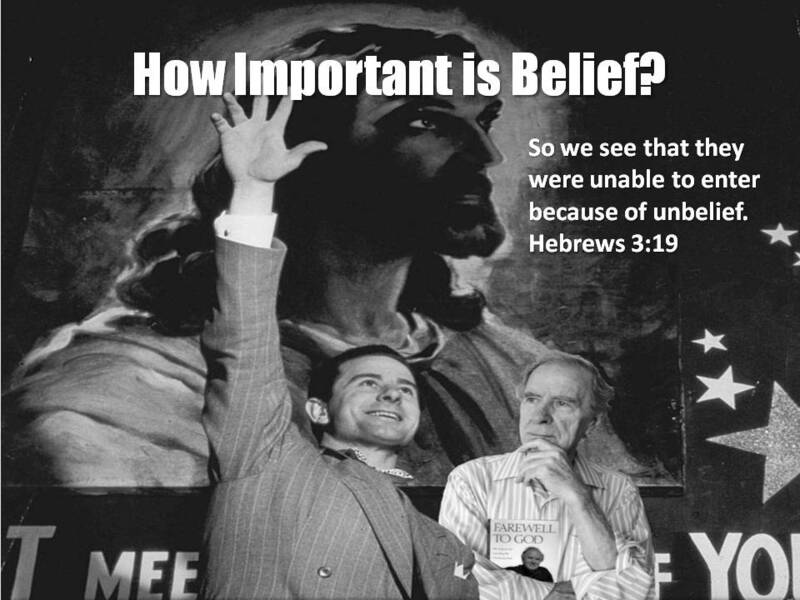 Templeton, Graham, and a few others regularly spoke to thousands, winning many to Christ both in America and in Europe. Newspapers and magazines carried reports of his meetings informing readers he was winning 150 converts a night. In Evansville, Indiana, the total attendance over the two week campaign was 91,000 out of a population of 128,000. Church attendance went up 17%. All was not well with Charles Templeton. He was beginning to question the essentials of the Christian faith, because he could no longer believe God’s Word beginning with Genesis. In his autobiography, Farewell to God, Charles Templeton lists his ‘reasons for rejecting the Christian faith’. Most of these relate to the origins issue and thus the accuracy of the book of beginnings—Genesis. A whole generation of Jews died in the wilderness because they refused to believe God. 1. There is a (Secret) Rest of God that people can find on Earth. 2. Most people live their entire lives without finding God’s rest. Why do I say most people will not? 1 Corinthians 10:5-6 Nevertheless, with most of them God was not pleased, for they were overthrown in the wilderness. Now these things took place as examples for us, that we might not desire evil as they did. In the Exodus we find the real life story of God using Moses to bring the Jewish Nation out of Egypt and into the Land which God had promised Abraham over 400 years earlier. God worked miracle after miracle on behalf of His people. The Plagues, the death of the first born, the Passover meal, the spreading of blood, the parting of the Red Sea, the crossing on DRY ground, the death of the mightiest Army on Earth by drowning in the Red Sea. Then we have the miraculous manna, quails, fire, cloud of smoke, and thunderous voice from the mountain. You could not have made a more tremendous movie to demonstrate the REALITY of the LIVING GOD! If you would have been there you would have told those Jews that wanted to give up and go back to Egypt that they were crazy! Didn’t they see that God is real and all-powerful? 1 Corinthians 10:1-12 For I want you to know, brothers, that our fathers were all under the cloud, and all passed through the sea, and all were baptized into Moses in the cloud and in the sea, and all ate the same spiritual food, and all drank the same spiritual drink. For they drank from the spiritual Rock that followed them, and the Rock was Christ. Nevertheless, with most of them God was not pleased, for they were overthrown in the wilderness. Now these things took place as examples for us, that we might not desire evil as they did. Do not be idolaters as some of them were; as it is written, “The people sat down to eat and drink and rose up to play.” We must not indulge in sexual immorality as some of them did, and twenty-three thousand fell in a single day. We must not put Christ to the test, as some of them did and were destroyed by serpents, nor grumble, as some of them did and were destroyed by the Destroyer. Now these things happened to them as an example, but they were written down for our instruction, on whom the end of the ages has come. Therefore let anyone who thinks that he stands take heed lest he fall. My Daddy used to say that hind sight is 50/50. Truth is, that of at least one million people over the age of 20 desired evil rather than believe God! Only two (and maybe their families) believed God! That’s like saying that out of the roughly 7 Billion people on Earth, only 14,000 are real followers of Christ! These Jews who experience so much, instead of reaching the Rest which God had promised, as symbolized by the Promised Land, fell in the wilderness, having been overcome by their desire for evil. 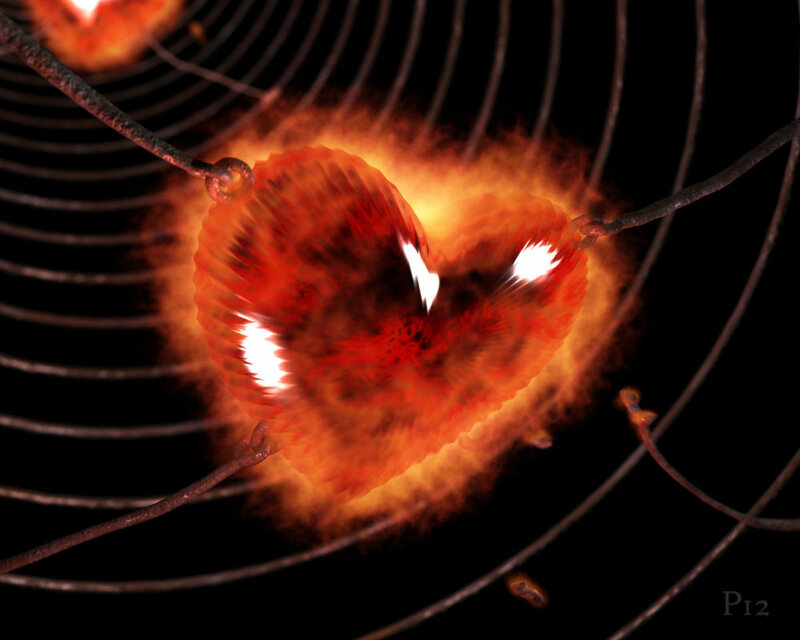 How Do You Reveal an Evil Heart? Now how did the Jews illustrate their evil hearts? Through what they did? 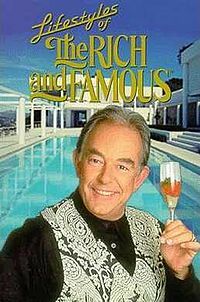 Through heinous crimes? NO! 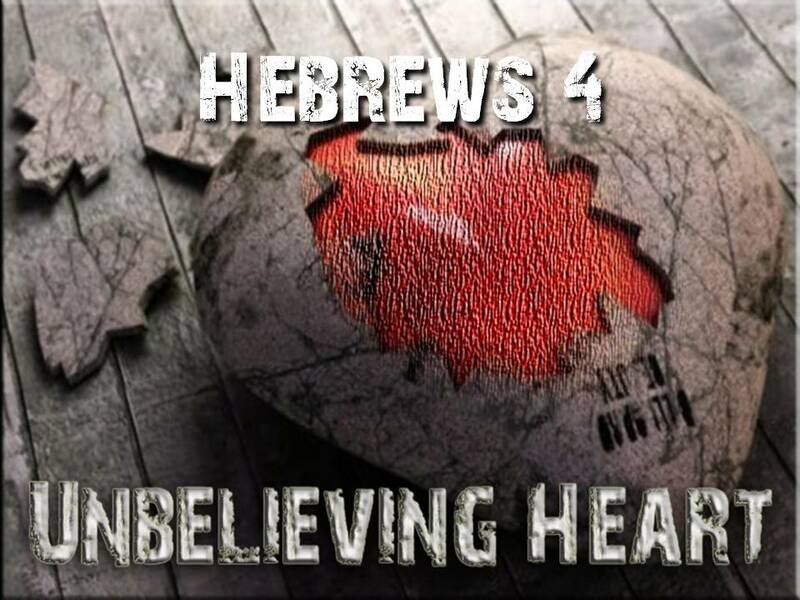 Evil hearts are revealed by what you believe about God and what He promises! No! 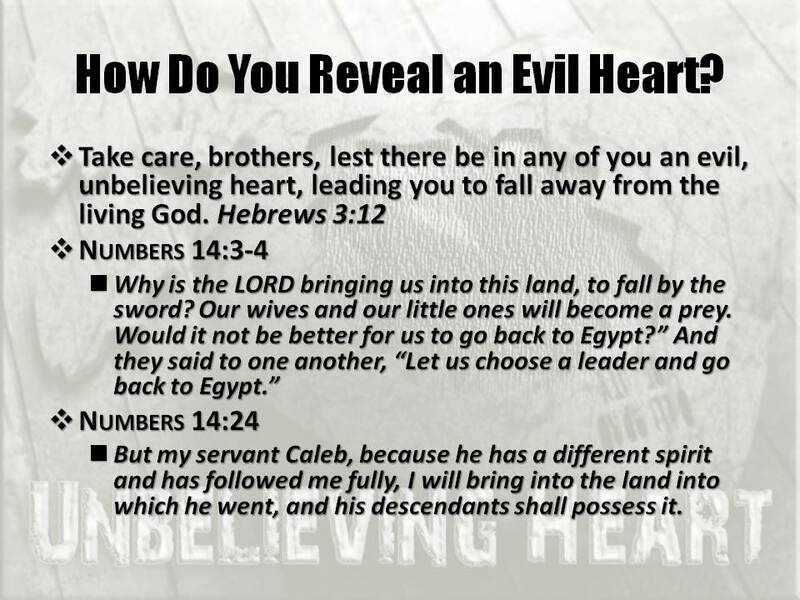 They revealed their evil hearts by not believing God! No way, you say! Surely it took something much worse, like murder or assault or robbery! No, they did not believe God was with them! They did not believe God would do what He said He would do. These Jews failed to believe the power of the Word of God, even though they had seen mightier miracles than anyone ever had! God promised to be with them as they went to conquer the land, but they focused on the size of the inhabitants rather than the size of their God! Only Caleb realized the Power of God, and his life was marked by a “different spirit!” Caleb represents the believer who sets his mind on the Spirit of God rather than the world! 1 John 5:4-5 For everyone who has been born of God overcomes the world. And this is the victory that has overcome the world— our faith. Who is it that overcomes the world except the one who believes that Jesus is the Son of God? 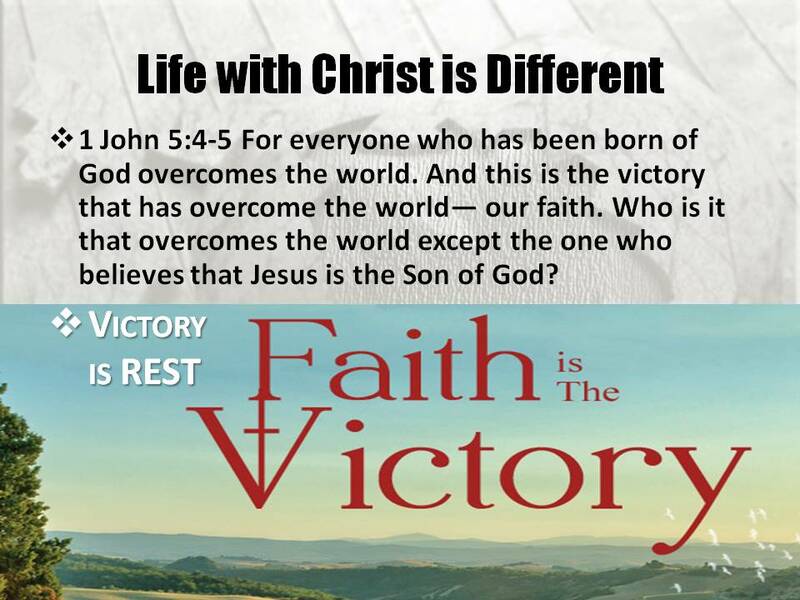 Hebrews 4 uses another word for victory and overcome, the word REST! God paints a picture of Rest in Exodus and Joshua. God paints a picture of Rest in Ephesians. Rest doesn’t mean you lie back and do nothing. Rest means you stand and do everything in full reliance and full confidence of the Life of Jesus Christ in you. Rest means when the boat is rocking and the winds are blowing your heart is calmly trusting in Christ, even while He is sleeping in the back of the boat. Rest means that when you are facing giants, and you are swinging your sling, you know God is directing the stone. Rest means that when a battle is raging, that you simply must rely on strength from God. Rest means that whatever the pain, whatever the circumstance, whatever the pressure, that God will see you through it, and that it will benefit your Eternity. Power to overcome the Giants of sin. Courage and Confidence in the face of trials and hardships. 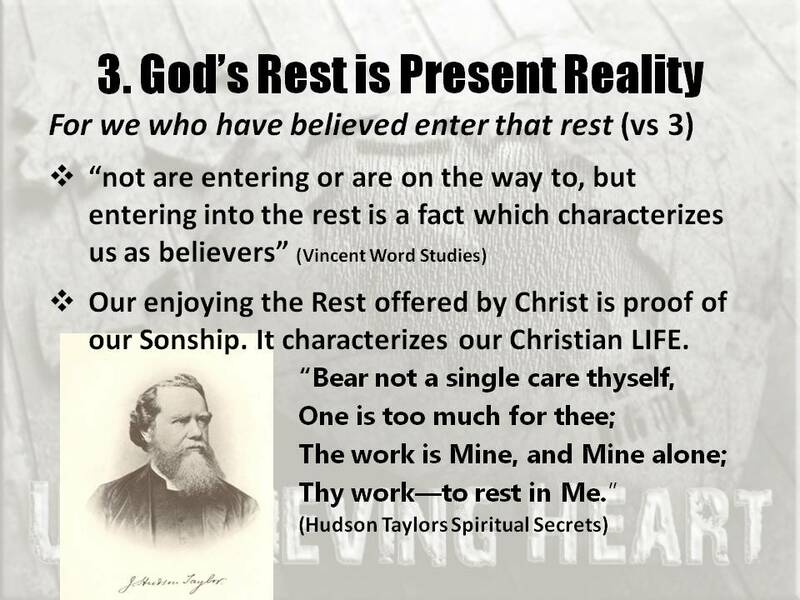 Are you Resting in the Reality of a life in Jesus Christ? The FOCUS of your belief is to actuate the REST we have in Jesus Christ. I want to talk to you about REST and How you obtain it! WHAT PROMISES ARE YOU NOT RESTING UPON? If you can believe Him about that promise, what about these others? Does your daily walk reveal that you are trusting God in these areas of your life? What about His promise of Peace. What about His promise of Joy. What about His promise to care for you. What about His promise to clothe and feed you. What about His promise to Love you. What about His promise to cast our fear. What about His promise to be free from the power of sin? What about His promise of victory, about being more than conquerors? God has a plan for his people to join him in the wonderful restfulness of heaven where all weariness and burdens will be lifted. 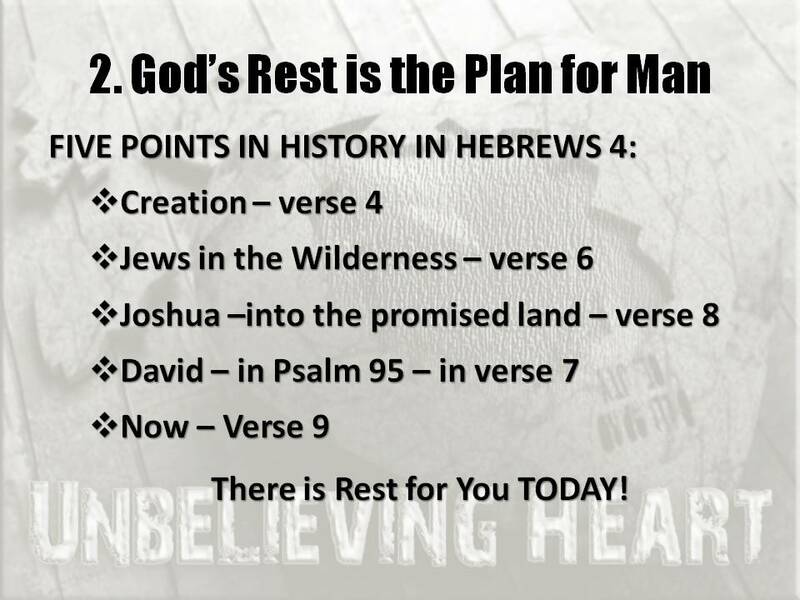 The writer focuses on five points in history to show how God’s plan is for mankind to find rest in Him. If God rested, what is the lesson for man? His people can rest and enjoy fellowship with him. He will call it a “Sabbath rest” because on the seventh day God rested. Jews in the Wilderness: The promised land is a picture of God’s ultimate rest, and their unbelieving rebellion excludes them from it. Joshua, who took the people into the promised land.  Is that the final, ultimate rest God in mind for his people? Verse 8 answers no: “For if Joshua had given them rest, He would not have spoken of another day after that.” In other words, even though Joshua gave some relief to the people of God in the promised land, that was not the final rest God has planned for them. How do we know that? God spoke of another day — another rest centuries later. 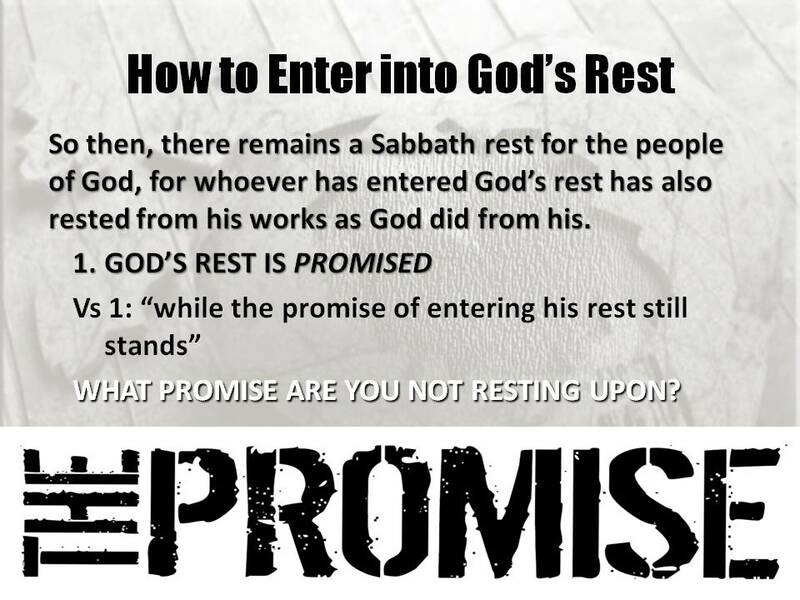 The fifth time period is NOW — Verse 9: “There remains therefore a Sabbath rest for the people of God.” In other words, Today, the rest is still open. And that is the foundation of God’s message to you today: There is a rest open to you today. God offers rest. The door is not shut. The time is not past. “not are entering or are on the way to, but entering into the rest is a fact which characterizes us as believers” Our enjoying the Rest offered by Christ is proof of our Christianity. It characterizes our Christian LIFE. Christ offers us TWO rests. One is unconditional, and is offered to all who by weariness simply come to Him, admitting their weakness and need. The second rest is conditional. The rest for your soul comes only as you yoke your life with His, and then pay close attention and learn from Him! 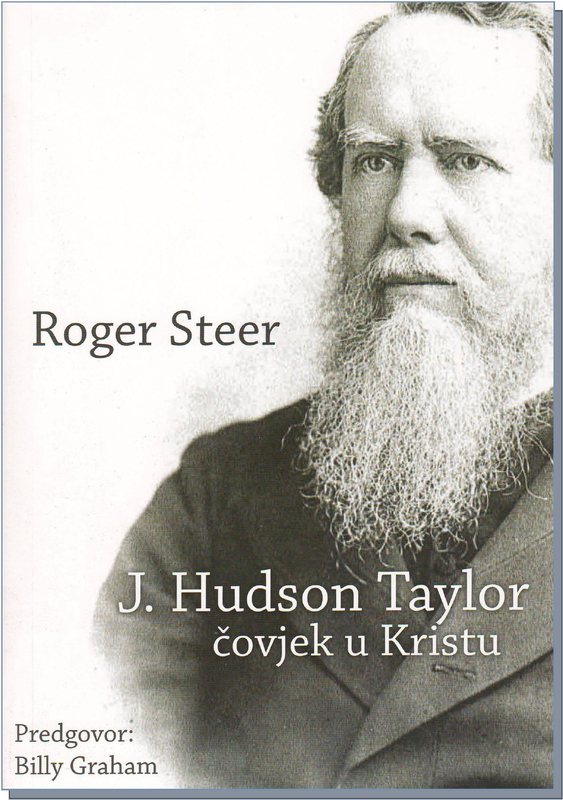 Hudson Taylor had a distinct moment when he entered into that second rest. He writes about it in his autobiography. Thy work—to rest in Me. To let my loving Savior work in me His will, my sanctification, is what I would live for by His grace. Abiding, not striving nor struggling; looking off unto Him; trusting Him for present power; . . . resting in the love of an almighty Savior, in the joy of a complete salvation, “from all sin”—this is not new, and yet ’tis new to me. I feel as though the dawning of a glorious day had risen upon me. I hail it with trembling, yet with trust. I seem to have got to the edge only, but of a boundless sea; to have sipped only, but of that which fully satisfies. Christ literally all seems to me, now, the power, the only power for service, the only ground for unchanging joy. How then to have our faith increased? Only by thinking of all that Jesus is and all He is for us: His life, His death, His work, He Himself as revealed to us in the Word, to be the subject of our constant thoughts. Not a striving to have faith . . . but a looking off to the Faithful One seems all we need; a resting in the Loved One entirely, for time and for eternity. 4. 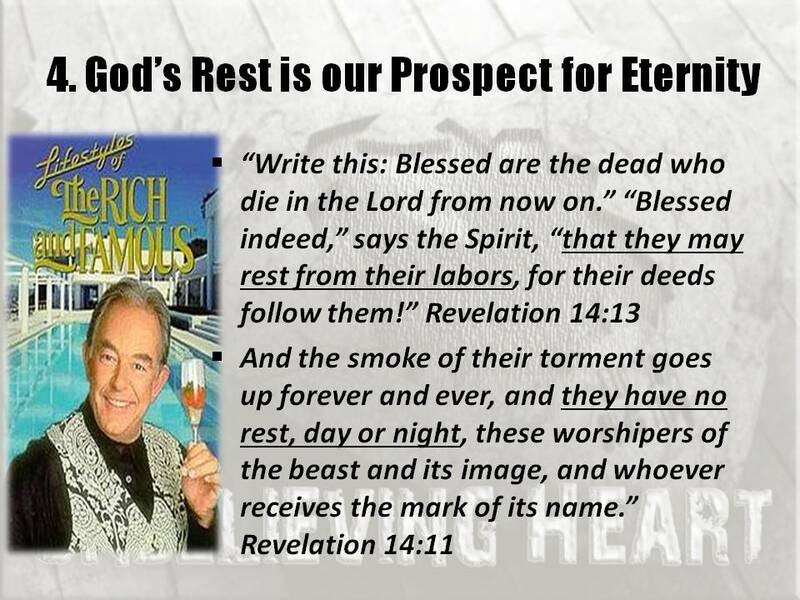 God’s Rest is our Prospect for Eternity! Christ promised anápausis (inner rest) in this age, not katápausis (, structural rest), the Sabbath rest of the age to come, which “remaineth…to the people of God” (Heb. 4:9–11). Anápausis is rest and peace of soul in the midst of hard labors, while katápausis is a periodic cessation from labor. How Do We Enter This Rest? Salvation is much more than a ticket to heaven. It is much more than asking Jesus into your heart. Actually Jesus wants permission to take over your life. He wants to be Lord! Remember Popeye? Remember what gave him his super strength? Well to enter God’s Rest, you need to eat plenty of LET-US! 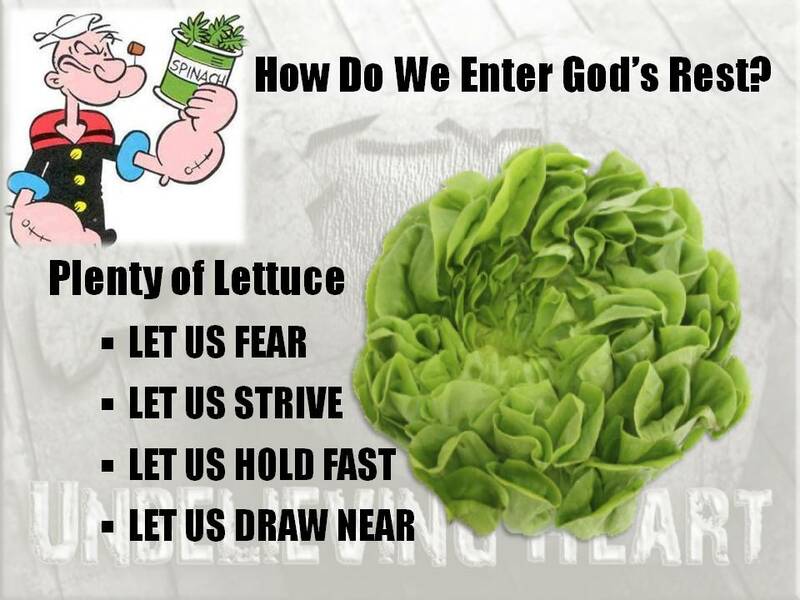 God’s Rest is built upon a bed of LETTUCE! This fear is not the terror felt by a slave. This is deep reverence and respect. This is what Paul tells us in Philippians. 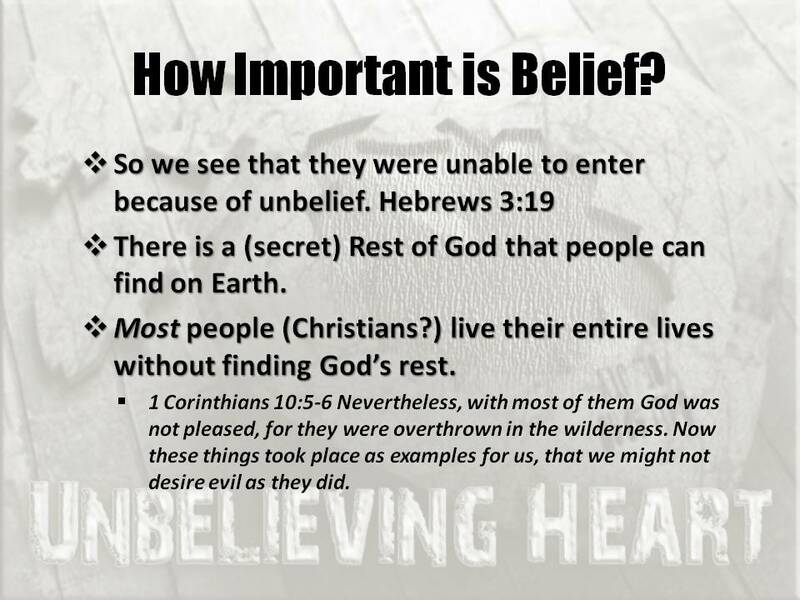 Why should we approach our salvation with fear & trembling?…because the thing we have to watch out most for is “unbelief or faithlessness.” If 99.9% of people who saw the greatest evidence of God EVER can fall away through unbelief, how easy is it for us to fall away? “there is only one thing to fear: faithlessness. Fear unbelief in the promises of God. Because as long as you are trusting in the promises of God you can be utterly fearless in the face of anything, even death, even God (see 4:16). Since so many have fallen, we have cause to fear (Heb 3:17-19 And with whom was he provoked for forty years? Was it not with those who sinned, whose bodies fell in the wilderness? And to whom did he swear that they would not enter his rest, but to those who were disobedient? So we see that they were unable to enter because of unbelief. STRIVE: to be diligent, earnest, or eager..
Do our utmost to focus on the rest. There is no room for mental laziness. Think with all you have on Gods rest. Be in the Word of God! It is Living – (not dead) Alive! Powerful – (not weak) Energetic, active, productive, effective. Activity which produces results. 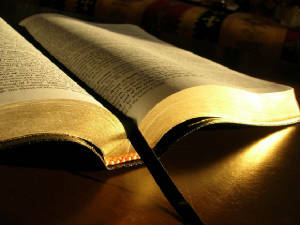 Often used for Divine activity which produces effective results! – It does what it promises!!! Sharper – (not dull) God’s Word can cut through anything! The Sword of God is a sin slayer! – It has stains of blood all over it…even up to the hilt! It is 2-edged thus it cuts us 2 ways – 1st deeply that we might die; then it cuts us again that we might live! (i.e.) the extreme power of penetration of the Word of God, to the very core of man’s being! Discerner – (not ignorant) God’s Word sifts through the hearts thoughts & attitudes w/unerring discrimination! Do you ever feel I’m talking right to you & a situation that you are going through? I hope you take it personal. I hope you get cut from God’s word while I’m teaching…else I am not wielding it properly! (13) naked & open – (not hidden nor veiled) there is nothing to hide in or behind. Open – different suggestions to this words meaning. Refers to the wrestler’s art of seizing one by the throat rendering him limp & powerless. The meaning is clear, all creatures are in the grip of God, totally vulnerable, helpless, & laid bare before his eyes, of Him to whom we must give account! God sees everything…This can be discomforting…IF you have something to hide! Take Hold of Christ, even in your weakness. 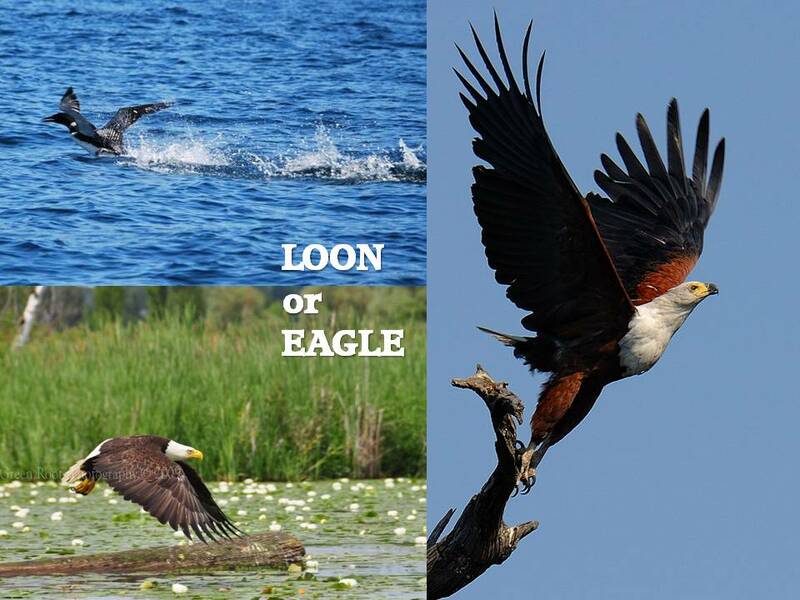 Are you a Crazy Loon or a Majestic Eagle? Who are you believing in and relying upon for life? without any wind blowing it was almost impossible for them to take off and fly. I took his word for it, but it didn’t seem to make sense to me until one evening some time later when my brother and I were out fishing. Not a breeze was stirring, and the surface of the small lake was like glass. The quietness of the moment was suddenly broken by the loud flapping of wings. Evidently we had scared “Mr. Loon,” and he decided to get out of there. Yet, despite his heroic effort, he just skimmed along the surface of the water unable to gain altitude. Reaching the other side of the lake, he still wasn’t high enough to clear the trees, and, executing a fancy turn, he came back toward us still flap-ping his wings with all his might. We held our breath as he reached the opposite shore, barely missed the treetops, and disappeared from view. He had made it — but what a struggle! Re-calling that experience, the thought came to me: what a contrast there is between that struggling loon and the majestic eagle which ascends high in the heavens with wings outstretched, gliding effortlessly to new and thrilling heights. The flapping loon and the soaring eagle portray two kinds of Christians. 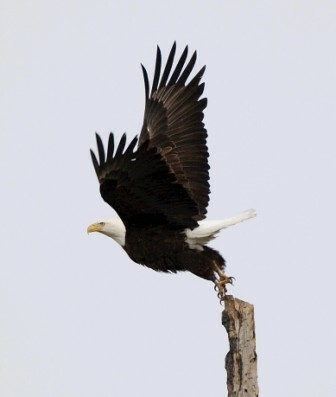 There are some dear souls who seem to be always “flapping” without making much headway, while others can truthfully and joyfully sing with the hymn writer, “New heights I’m gaining every day.” The latter are those who have learned to wait upon the Lord, have renewed their strength, and hence “mount up with wings like eagles” (Isa. 40:31). Ἐισερχόμεθα categorical; not are entering or are on the way to, but entering into the rest is a fact which characterizes us as believers. Marvin R. Vincent, Word Studies in the New Testament, (New York: Scribners, 1887), WORDsearch CROSS e-book, Under: “Hebrews 4:3”. Robert Jamieson, A.R. Fausset, David Brown, A Commentary: Critical, Experimental, and Practical on the Old and New Testaments, (Toledo, OH: Jerome B. Names & Co., 1884), WORDsearch CROSS e-book, Under: “HEBREWS”.